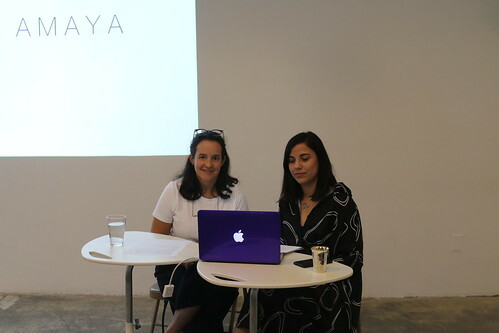 Residency Unlimited (RU) will host a conversation between Mexican artist, Karian Amaya, and independent curator, Monica Espinel. With a practice spanning drawing, photography, sculpture and installation, Amaya explores notions of subjectivity and the self. The artist’s formative years spent in the North of Mexico inform her deeply personal and quietly political works. At the core of Amaya's practice lies a deep concern with process and the specificity of materials, with each series searching for a formal solution informed by Minimalism that explore themes related to the body, language, time and the landscape. Join them for a discussion of Amaya's work from 2014 through today to conclude Amaya's participation as resident artist at RU. Karian Amaya holds a BFA from Universidad de Guadalajara and pursued studies in Mixed Media at The Art Students League of New York. Her work has been exhibited in Mexico, USA and Switzerland. In 2015 she participated in the New York Foundation of the Arts' Immigrant Artist Mentoring Program. In 2016 she was included in the Border Biennial held at El Paso Museum of Art. She is the recipient of numerous awards including Estimulos de la creación artistica PECDA (2013-2014), the Alfaro Siqueiros Scholarship (2017) and the Legado Grodman Grant awarded by the UDG Foundation (2018). See the exhibition history here. Monica Espinel is an independent curator and writer based in New York. Selected curatorial projects include ‘‘Black Milk: Theories on Suicide’’ (Marvelli, 2004), "Carmen Herrera: Estructuras" (Latincollector, 2008), ‘‘Fanny Sanín: A Chromatic Journey, 1966-2006’’ (Latincollector, 2008), ‘‘Ceremonies of Summer’’ (Latincollector, 2008), ‘‘Then & Now: Abstraction in Latin American Art’’ (Deutsche Bank, 2010), ‘‘Memory Leaks’’ (Creon, 2010), “Rituals of Chaos” (Bronx Museum of the Arts, 2012), “The Skin I Live In” (Curatorial Lab, SP-Arte, 2013) and “Bruno Miguel: Todos à Mesa” (Galeria Emma Thomas, 2015), "VivArte - Women" (Phillips, 2016) and "Hybrid Topographies - Encounters from Latin America" (Deutsche Bank, 2018). She is the recipient of numerous awards including ArtTable’s Mentorship Grant to be a curatorial fellow at Wave Hill (2009), a Milton & Sally Avery Arts Foundation Curatorial Fellowship at the Bronx Museum of the Arts (2010) and a Roswell L. Gilpatric Award to work in the department of Photographs at The Metropolitan Museum of Art (2011). She was a mentor for the Liverpool Biennial Associate Artists Programme and her writing has been featured in artist catalogues and ArtNexus, Arte al Dia, Flash Art and Artforum.com. This program is made possible with support from Grodman Legacy University of Guadalajara Foundation USA.